When temperatures plummet, it can be hard to find motivation to go outside and brave the arctic blast. Fortunately, restaurants across the state offer big warm fireplaces so that you can feast in front of a toasty fire. 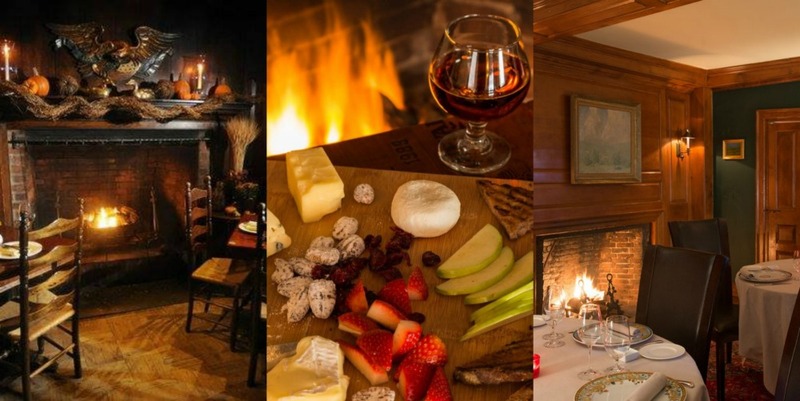 Here are over 25 cozy fireside dining venues in Connecticut. Tavern at Graybarns, Norwalk: Tavern at GrayBarns is situated in the space that once housed Silvermine Tavern featuring elegant American fare. The Goose, Darien: With its luxurious old style bar and welcoming tavern feel in the dining area, The Goose in Darien is a great place to enjoy soups, salads, sandwiches, seaside-inspired lobster tacos, and entrees like St. Louis-Style Ribs and Steak Frites. Gabriele’s Italian Steakhouse, Greenwich: Gabriele’s in Greenwich is a quintessential steakhouse that also offers Italian specialties. Aged leather wingback chairs, a hulking stone hearth, fireside tables, and private dining in the wine room all set the scene for hearty food. The Griswold Inn, Griswold: The Griswold Inn is one of the oldest continually operating inns in America- the restaurant opened its doors in 1776! Serving classic American fare such as clams casino, roasted cod, braised short ribs, and sticky toffee pudding, you will thoroughly enjoy this dose of Connecticut history. The Copper Beach Inn, Ivoryton: The Copper Beach Inn in Ivoryton is an intimate country inn in the charming CT river valley. Meals showcase classic New England fare and fireplaces contribute to the ambiance. White Horse Country Pub & Restaurant, Marbledale: In addition to copious “artifacts” to look at bottles of port written by Charles Dickens, a piece of Martha Washington’s wedding dress), guests can feast on juicy burgers, Guinness Beef Stew, Lobster and Scallop Pie, and more at The White Horse Country Pub & Restaurant. Harbour House, at The Inn At Mystic: Did you know that Bogey and Bacall spent their honeymoon at the Inn at Mystic? Capture a little of that golden era of romance and head to Harbour House. Cava, New Canaan: At Cava in New Canaan, enjoy Italian delights like grilled octopus, pizzas, profiteroles, and biscotti. Union League Cafe, New Haven: At Union League Cafe in New Haven, the old world feeling of a Parisian Brasserie is captured and elegantly delivers the best of French traditional food with a modern flair. Cask Republic, Stamford, New Haven, Norwalk: Cask Republic serves comfort-inducing food in a fun atmosphere. They offer long, shared tables and fireside seating. O’Neill’s, Norwalk: O'Neill's in Norwalk promises “The Soul of Ireland in the Heart of SoNo” for brunch, lunch and dinner. The fire adds to the cozy, laid back, Irish vibe. Fresh Salt, Old Saybrook: At Fresh Salt in the Saybrook Point Inn & Spa, views of Long Island Sound pair beautifully with the nautical modern feel of this space, with its gleaming wood and natural elements. Bernard’s, Ridgefield: With fine dining downstairs and a wine bar upstairs, Bernard’s in Ridgefield has been going strong for 15 years with its French-inspired cuisine and tasting menus. Little Barn,, Westport: Little Barn in Westport has two fireplaces- one outside and one inside! Little Pub, Wilton, Fairfield, Greenwich, Ridgefield: Dark beams, fireplace, and tapestries make meals at Little Pub fun and cozy (albeit loud). Choose one of their hardy selections like Lobster Mac and Cheese, Poutine, Queso Fundido, Fish-n-chips, or a Going to Graceland burger to accompany their extensive beers. Restaurant @ Rowayton Seafood, Rowayton: Truffled lobster mac and cheese, raw bar selections, tuna sashimi flatbreads, buffalo calamari wraps, beer battered entree... Rowayton Seafood is where to get fresh delights from the sea. Millwright’s, Simsbury: Centuries-worn wood beams and old New England stone keep this 17th century mill standing strong in the heart of Simsbury. Millwright’s graciously serves New England inspired cuisine and about 80% of the ingredients come from local CT and upstate NY purveyors.Artisan, Southport: Artisan in Southport has a more laid back tavern in addition to their formal dining room. It boasts a fireplace- perfect for nights when it's chilly outside! Tavern on Main, Westport: Once a sea captain’s home, Tavern on Main in Westport boasts three original fireplaces. Artisan cheese boards, Parmesan Truffle Frites, Hot Potato Chips, House-Smoked Salmon on Sweet Potato Blini, Lobster Pappardelle, Spiked Mulled Hot Cider...a cold evening never felt so nice. Sharpe Hill, Pomfret: Sharpe Hill vineyard in Pomfret doesn't just offer wine- their dining room is appropriately names "Fireside Tavern"
Kensington’s @ Norwich Inn, Norwich: The Norwich Inn has two restaurants, the more casual Ascot's Pub and a formal dining room known as Kensington's, that both offer fireplaces. Bonus: the Inn also houses a spa so that you can get pampered before indulging in a tasty meal! G.W. Tavern, Washington: G.W. Tavern in Washington is a colonial themed tavern with classic comfort foods and a roaring wood-burning fireplace. Daniel Packer Inn, Mystic: Sea Captain Daniel Packer built the Daniel Packer Inne in Mystic in 1756. Fireplaces contribute to the historic atmosphere. Homestead Inn, Greenwich: The Homestead Inn is home to a four star restaurant by Thomas Kenkelmann serving up oustanding French fare. Abigail’s Grille & Wine Bar, Simsbury: If you're lucky enough to get the booth next to the fireplace at Abigail's Grille and Wine Bar in Simsbury, you're in for the ultimate fireside dining experience. The Olive Tree Restaurant, Woodbury: The Olive Tree Restaurant in Woodbury has the feel of a country farmhouse..
Positano, Westport; Positano Ristorante in Westport occupies the space that once held the Dressing Room.